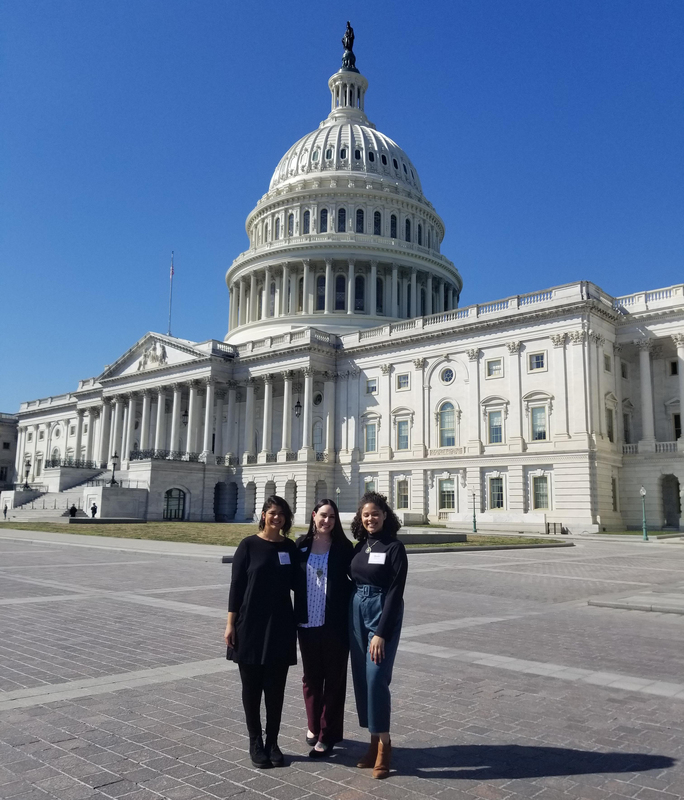 Representatives of the Center for International Programs at SUNY New Paltz travelled to Washington, D.C. during spring break to meet with members of Congress as part of NAFSA: Association of International Educators’ 2019 Advocacy Day. Shanice Mateo ’19 (Theatre Arts) and Izabelle Silva do Nascimento ’19 made the trip along with International Recruitment Manager Amanda Stevens. Upon arrival in D.C., they first met with fellow higher education advocates for training and strategizing, before heading to Capitol Hill to talk to elected representatives in both the U.S. Senate and House of Representatives about how international education impacts the state of New York and the district and why they feel we need a more globally engaged and welcoming United States. Mateo is a domestic student at SUNY New Paltz who studied abroad in spring 2018 at Kingston University in London, England. She received financial support through the highly competitive Benjamin A. Gilman International Scholarship Program. New Paltz is among the top colleges in the nation at helping students support their study abroad goals through Gilman Scholarships. Silva do Nascimento is an international student from Brazil, currently studying at New Paltz in the Haggerty English Language Program. Upon completing the program this may, she expects to enroll as a graduate student in the College’s Humanistic/Multicultural Education program.